Alex O'Connell 9 points, 3 rebounds, 1 block and 1 assist in Duke win. 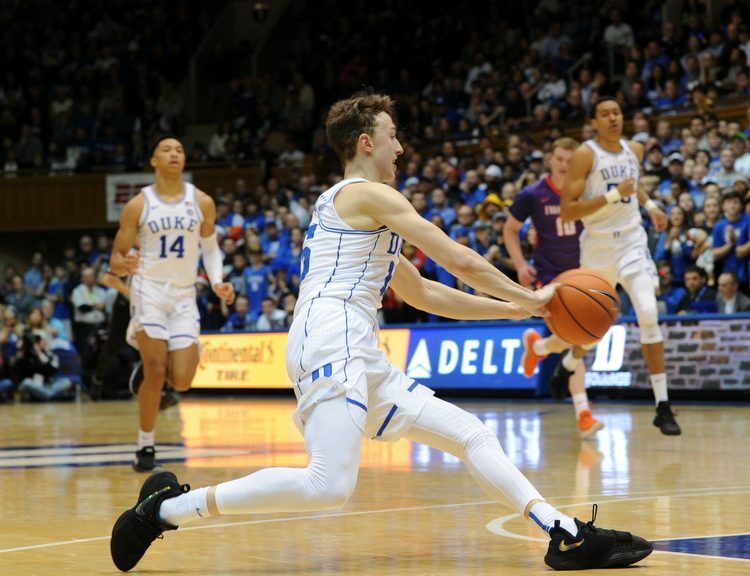 The Duke Blue Devils completed yet another undefeated season against non conference opponents in Cameron Indoor Stadium. With a dominant 104-40 win over Evansville, the Blue Devils pushed their streak to an NCAA best 139th straight win. 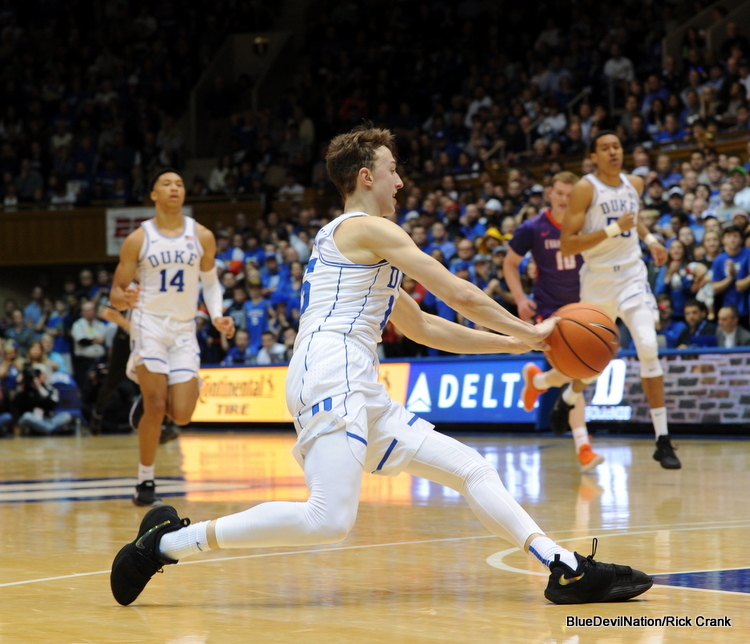 Duke used a suffocating defense that held Evansville (10-3) to just 15 field goals on the evening. In fact, there was one stretch in the game where the Blue Devils outscored the Purple Aces 42-3. The Blue Devils now go into the Christmas breaks with an upbeat if not feel good win. The team is now 12 -1 on the season and will not return to the court until December the 30th against Florida State in a game that will be televised from Cameron on CBS. Despite the students being on vacation, local and Duke fans from afar packed Cameron Indoor Stadium and were vocal in their appreciation. Of course, with a stellar team win, that made for the festive atmosphere. By games end, the Blue Devils had played many players and the bench guys showed well. 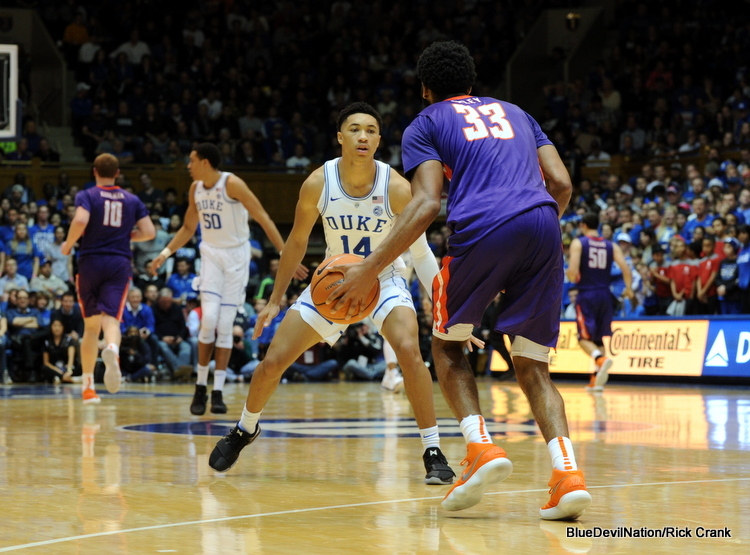 Jordan Goldwire would end the game with 7 assists, while Justin Robinson would knock down back to back threes which brought those at Coach K court to their feet. Jack White would only score two points but his thunderous dunk punctuated an evening when many things went right. 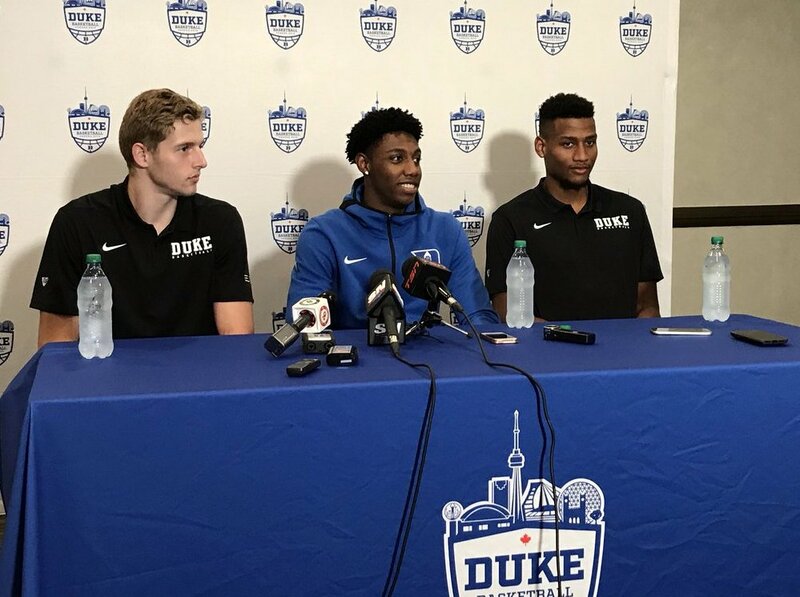 Duke shared he ball, dishing out 34 assists which pleased Mike Krzyzewski in his post game press conference. 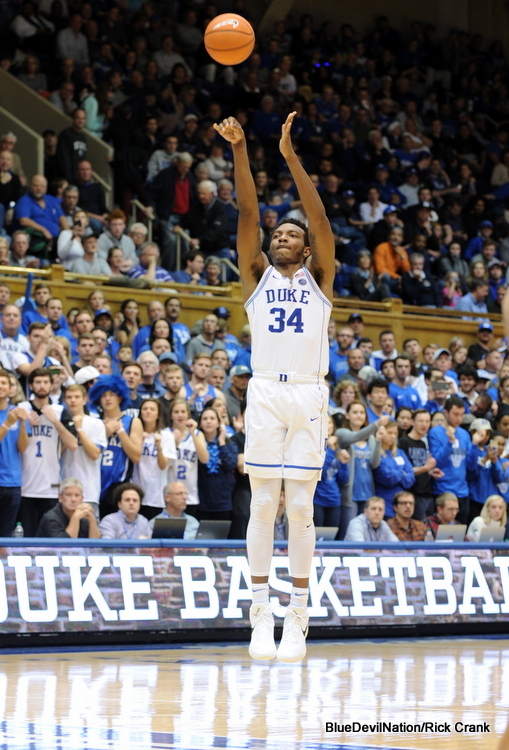 Duke shot a blistering 16 of 26 from beyond the three-point stripe and it was Duke freshman Wendell Carter Jr. that took 7 of those shots. Carter who ended the game with a career high 27 points knocked down 4 of 7 three pointers. Overheard was somebody saying in a light manner that he was the new JJ (Redick). There was a sense of accomplishment in the locker room. All the players seemed please with the team's performance. Many mentioned the hard work on defense and it was clear they all felt good going into the Holiday break. And they should feel good, for it was easy to see that their work had reamed rewards in improvement. It was easy to see from my vantage that the players were being more vocal and switching off their man in a more seamless fashion. This was the kind of game that cured some of the angst in wait the team had after their only loss of the season. Duke went to their bench just four minutes into the game as it became clear that the team had a feel of togetherness. That togetherness led to a dominant, feel good win for the team and the fan base. Notes - The Duke players will return on December the 27th. The coaches will be out on the road recruiting in force at the many holiday events. We will discuss where they will be in detail in a coming update for premium members. And remember, we have a special where you get double any membership time when you join before year's end. Javin DeLaurier was out nursing a hamstring injury and Jordan Tucker had an undisclosed injury as well. The margin of victory was the 7th largest in school history, Duke has made at least one three-point shot in 997 consecutive games. Marques Bolden matched his career high with 3 blocked shots. Grayson Allen moved to 24th on the all time scoring list. 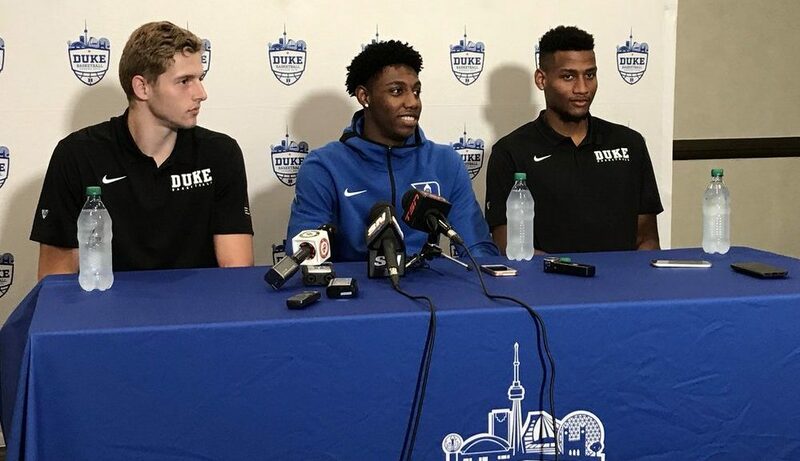 Alex O'ConnellGrayson AllenJordan GoldwireWendell Carter Jr.